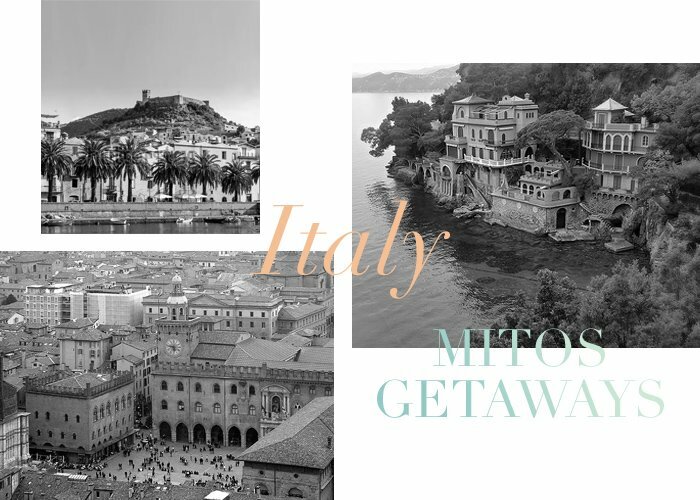 This season we will take you by the hand and travel together to all magnificent places Mitos Swimwear can be found. This time, with the temperature rising and finally as we feel summer is on its way, it’s a great time to head to Italy! Join us to historic Bologna, alluring Portofino and enigmatic Sardinia. If you want to wander in a city with hidden cultural gems and rich art history, then Bologna should be your next travel destination! In northern Italy, built inside medieval towers and vibrant due to Europe’s oldest university, Bologna is the perfect choice for true adventurers, architecture lovers and food enthusiasts. To make packing for your Bologna trip that easier, we’ve already picked the perfect outfit for your city walks. If you visit Bologna, don’t forget to visit Profumissime, to get your Mitos Frida Red bikini and Frida Red Pareo. A small picturesque coastal village, Portofino is a jet set destination for all the fashion and famous people around the world. The prettiest village in Italian Riviera is the perfect choice for romantic and alluring holidays. Stroll around the harbor, sip a fine Italian espresso and sunbath with your Mitos Fuego Triangle paired with your Mitos Pareo & Headband Fuego Black! When in Portofino, join Manebi store for your Mitos outfit! If you want white sand and turquoise waters, Sardinia should be on your travel to do list! An A-list destination for all beach lovers! Hire a yacht, lounge on the beach, dine and shop in style with your Mitos Otomi Red Triangle. Whether you are escaping for a rejuvenating break, or fancy enjoying parties on luxurious resorts, we’ve got the perfect selection of an outfit picked out to cater for your Sardinia trip! Manebi store is the top spot to visit for your Sardinia shopping! Find your MITOS in Italy at Profumissime in Bologna, Manebi in Portofino, Sardinia and Acquacalda!